Introduction: Maltrodextrin is a complex carbohydrate although it has a relatively high Glycemic Index meaning it is rapidly absorbed by the body in a manner similar to Dextrose. As it is easily absorbed by the body, it provides a rapid increase in energy levels as it raises blood sugar levels and restores glycogen quickly after consumption. Maltodextrin is a popular carbohydrate which is often combined with dextrose to optimise glycogen replenishment and performance. 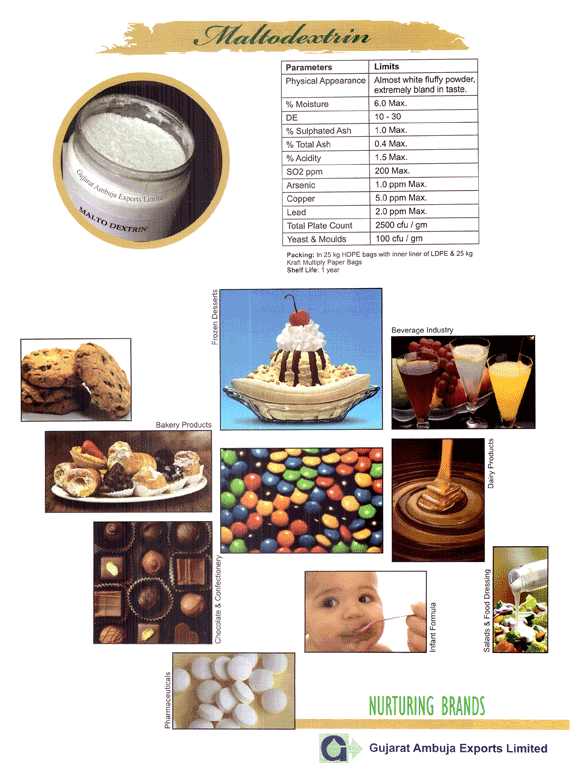 Maltodextrin and dried glucose syrup are used in combination with emulsifying carbohydrates. They are useful in maintaining emulsion stability and are good film formers, resulting in flavors that are conveyed in free flowing powders. 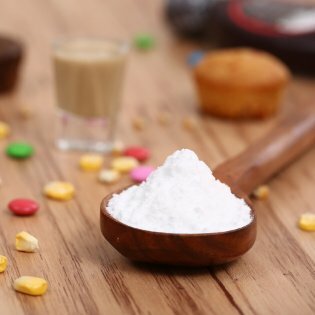 Maltodextrin and dried glucose syrup are used as bulking agents and serve mainly as a carbohydrate component in a number of different dry mix products, including dry beverage mixes, puddings, soups, frozen desserts, frosting, cake, cookie mixes, artificially sweetened cocoas, tea, coffee, etc. Probably one of the oldest uses of Maltodextrin and dried glucose syrup in the area of infant formulas, which is just part of a broader area of nutritional fluids. In this case, Maltodextrin serves as the carbohydrate in non-milk or non-lactose based fluids (usually soy protein based). The other area of nutritional fluids using Maltodextrin and dried glucose syrup is that of enteral products, which is usually administered as part of a patient’s care in a hospital setting. The use of Maltodextrin and dried glucose syrup in producing improved excipients for tabletting and more recently as direct tablet excipients. Malto Dextrin and dried glucose syrup are useful as ingredients in coating for both pharmaceutical and confectionary tablets and as coatings for trace elements. For ice cream, salad dressings, etc. Snack foods, meat products, industrial applications, low alcohol beer, etc. Physical Appearance White free flowing powder, extremely bland in taste. In 25 Kg HDPE bags with inner liner of LDPE & 25 kg Kraft Multiply Paper Bags.